In 2009 the Annette Obrestad led Team Europe dismantled the American Team captained by Daniel Negreanu at the inaugural Caesars Cup; a Rider Cup-esque series of matches pitting Europeans vs. Americans (including Canada). 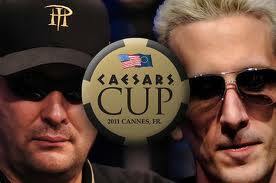 It took two years for the Caesars Cup match to return, and this time around the American team put together by Phil Hellmuth was able to revenge their 2009 loss. Unfortunately for Team Europe (which replaced Dario Minieri the day before the tournament began with Tony G) both Tony G and Jake Cody were both still alive and kicking in the World Series of Poker Europe Main Event, and were unlikely to participate in the Caesars Cup –Tony G busted fairly early and did play for Team Europe, while Cody went on to make the final table, but also took part in the Caesars Cup. This entry was posted on Thursday, October 20th, 2011 at 8:09 am and is filed under Poker News. You can follow any responses to this entry through the RSS 2.0 feed. You can leave a response, or trackback from your own site.